Around the world, organisations affiliated to War Resisters' International are working for a world free of violence and war. We have five key areas of work; each one is designed to support and nurture our struggle against war and militarism. In many countries around the world, it is still common for young people to be conscripted into their state's military. Our Right to Refuse to Kill programme combines a wide range of activities to support individual conscientious objectors, as well as organised groups and movements advocating for the right to conscientious objection. Resisting the causes of war takes time, energy, and skills. WRI's Nonviolence Programme delivers training and provides resources on the means and methods of nonviolent social change. We are currently building a new website, and writing a book about constructive forms of resistance, called "New Worlds in Old Shells". Around the world, the lives of young people are influenced by military values. Young people are exposed to recruitment drives, advertisements, and the presence of the military in popular culture. Our Countering the Militarisation of Youth programme is building a network of activists, organises the annual week of action against youth militarisation, and runs the antimili-youth.net website. Someone profits from every bullet that is fired and every bomb that is dropped in war - we call this war profiteering. WRI organises seminars and training for activists resisting the arms trade and other forms of war profiteering. We publish a quarterly magazine called War Profiteers News, a quarterly round-up of action updates and research. 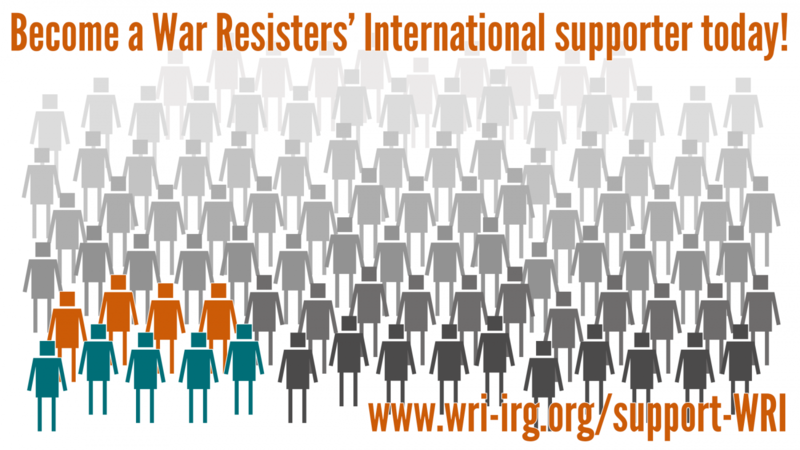 In Spring 2016, War Resisters' International launched a new campaign focusing on the escalating cycle of violence in Turkey. The campaign was a response to demands from WRI activists in Turkey and is being run in collaboration with them. As part of it, we organised a number of delegation visits to Turkey, published a report and articles, sent observers to the trials of human rights defenders and launched an online petition addressing the EU High Representative for Foreign Affairs Federica Mogherini. We are currently working on new activities to take place in 2017.